High Quality GXL Automobile, RV, Motorcycle, Truck/Trailer, Bus, Industrial Wire. Superior American made quality, copper conductor with smooth easy strip surface finish and excellent abrasion resistance. Has thermosetting insulation and is suitable for use in high temperature automotive wiring applications, moisture, grease, oil, gasoline, most acids and solvents. 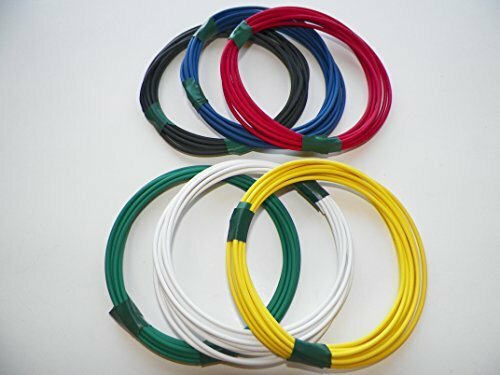 Insulation is thick walled chemically crossed link polyethylene, will not melt and has an operating temperature range of -40 to +125 degrees C.
Colors: BLACK, BLUE, RED, GREEN, WHITE, AND YELLOW 25' and 10' Lengths in coils. Highest quality GXL wire, Made In America for extreme conditions. Greater than 99 percent pure copper. For use in standard automotive, motorcycle, truck/trailer applications. If you have any questions about this product by 4RCUSTOMS, contact us by completing and submitting the form below. If you are looking for a specif part number, please include it with your message.